This essay proposes a framework of a mixed constitution for a free Cuba. By “free” I mean a republican, i.e., representative regime where the government is the product of competitive elections and the population enjoys judicially safeguarded political and civil rights.2 By “mixed” I mean one that, in keeping with Aristotle’s advice, incorporates several competing political principles or values in one coherent arrangement. 3 Finally, by “constitution,” I do not mean simply a document, which can swiftly decay into dead letter. Rather, I have in mind what Sartori calls the “living” or “material” constitution, i.e., the “the actual configuration of the system.”4 It is a structure or pattern of political power that is aimed at here, one that, however, is expected to emerge from a set of enforceable rules specified in the constitutional text. For their part, casting a skeptical glance at the academic consensus against presidentialism forged, inter alia, by Linz and Stepan,18 Shugart and Carey find that the survival of this type of democracy depends on the actual distribution of authority between congress and president, on the one hand, and the party system, on the other, which are a function of the constitution and electoral rules, respectively.19 They argue that the performance of presidentialism varies according to the relative powers vested in president and congress, their respective controls over cabinet formation and survival, and the number and internal cohesion of parties represented in the legislature. Presidential systems which centralize authority in the executive are the most vulnerable to breakdown. Where the president is granted legislative powers such as a strong veto, exclusive prerogative to submit bills over certain policy areas, strategic initiative over the budget, and rule by decree, and where he has authority to go over the heads of congress by calling a popular referendum to enact his program into law, executive-legislative relations tend to deteriorate to the point where the risks of regime breakdown become unacceptably high. By contrast, the longestlived presidential democracies are those where the constitution contemplates a president whose role in the making of laws is marginal at best.20 Costa Rica, the oldest continuous democracy in Latin America, is a case in point. Another problematic type is what they call the “presidential- parliamentary” regime, one of shared authority over the cabinet, with the president being free to appoint and dismiss but the parliament able to censure and force the resignation of ministers. This form of government, plagued by “‘confusion’ over to whom the cabinet is responsible, is a recipe for dangerous cabinet instability. This is especially true where one branch alone names the cabinet to begin with.”21 In a confirmatory study of 14 Latin American countries over a ten year period, Jones, too, found that “the legislature’s possession of the power to censure government’s ministers results in an increased level of executive-legislative conflict.”22 As we shall see, this was a feature of the Cuban Constitution of 1940. In the remainder of this essay, I draw on these two streams of research to design a framework for crafting a constitution for a free Cuba. My purpose is not to expound on all the elements that go into a constitution. Rather, I limit myself to sketching what, according to Sartori, should be its “core and centerpiece,” i.e., a “frame of government.”28 That means a plan for partitioning authority horizontally, across branches of the national government, and vertically, among levels of government, specifying qualifications for office, election or appointment rules, and length and staggering of terms for each office. Much of what follows is rather conventional, incorporating as it does variations of constitutional formulas of long usage, either in the United States or, as in the case of the supreme electoral tribunal, Costa Rica. However, I do offer a few innovations that, as far as I know, have not been tried elsewhere. I begin with a brief discussion of the last democratic constitution of Cuba, that of 1940, paying particular attention to what I consider to have been its principal structural weaknesses. Next, I lay out my proposal. Then I analyze it in light of the literature discussed above, and compare and contrast its most salient features to those of the 1940 Constitution. Institutionally, the 1940 Constitution attempted to do the very thing which Shugart and Carey believe one should avoid, i.e., construct a “presidential-parliamentary” republic.32 It provided for separate but concurrent elections of a president and a bicameral congress, all to a four-year term, with half the lower house elected every two years. The president was free to appoint and dismiss members of his cabinet, but these, including a prime minister, were responsible to the congress. Either house could interpellate and censure ministers individually or the cabinet as a whole, upon which vote of no confidence they were required to resign. The president, however, was free to reappoint them to another portfolio. This appears to have happened in the case of President Grau San Martín, elected in 1944. First, he intrigued to amend the constitution. That went nowhere, it having met with opposition even from within his own party, the Auténticos. So, after vacating the presidential palace he lost no time in criticizing his successor, Carlos Prío Socarrás, a former protégé, expressing regret at having “made” him president and characterizing him as an “unfaithful disciple.”37 That set the two men at loggerheads. For his part, Batista, who had won a senate seat in 1948, and was eligible for election to the presidency in 1952, entered the race. A May 1951 survey showed him trailing badly, with only 20 percent of respondents favoring his candidacy. Less than a year later the Auténticos still outnumbered Batista’s party two to one among registered voters.38 Three months before the election, Batista staged a coup. The last organic problem in the 1940 Constitution I will take up has to do with the organization of provinces. It provided for the election of a governor, but not of a provincial assembly. Rather, a provincial council, made up of all the mayors of the province, was to exercise the legislative power. It was given authority to draw up a budget, to be financed by assessing each member municipality a quota in proportion to its revenues. In this aspect, the provincial government resembled a confederal arrangement. Not having read any studies of their operations, I have no empirical knowledge how the provincial governments worked in practice. However, my guess is that they were plagued by collective action and free-rider problems that are the bane of confederations, i.e., indifference on the part of many of their members, great difficulty in getting them to agree to undertake projects of common interest, and many municipalities falling in arrears with their financial obligations. In a unitary republic, it is meet to begin with the national government. Here authority is to be partitioned into overlapping branches, legislative, executive, and judicial. The legislative power, including the power to tax and spend, would be vested in a bicameral congress, composed of a lower house (cámara de representantes) and a senate. To be eligible for election, candidates for the lower house would be at least 25 years old, and for the senate 30. The cámara would consist of one member per 50,000 inhabitants, but in no case fewer than 199 representatives, elected for a three-year term according to a system of proportional representation requiring parties to cross a five percent threshold. The electoral units would be the provinces, with a number of representatives allocated to each in proportion to their total population. The senate would consist of 36 members, six from each province, elected at large, for a six-year term. The terms would be staggered so that every year onesixth of the senators, one per province, would be up for reelection.45 Should no candidate for the senate win 40 percent plus one of the vote, a run-off would be held between the two top vote-getters. Legislation could originate in either the cámara or the senate, except for expenditure and revenue bills, which would have to be voted out of the lower house first. In both chambers, a majority of the membership would constitute a quorum. To be enacted into law, a bill would have to be approved by both houses. Differences between the two versions of the same bill would have to be ironed out in conference. A threefifths vote in both chambers would override the president’s veto. 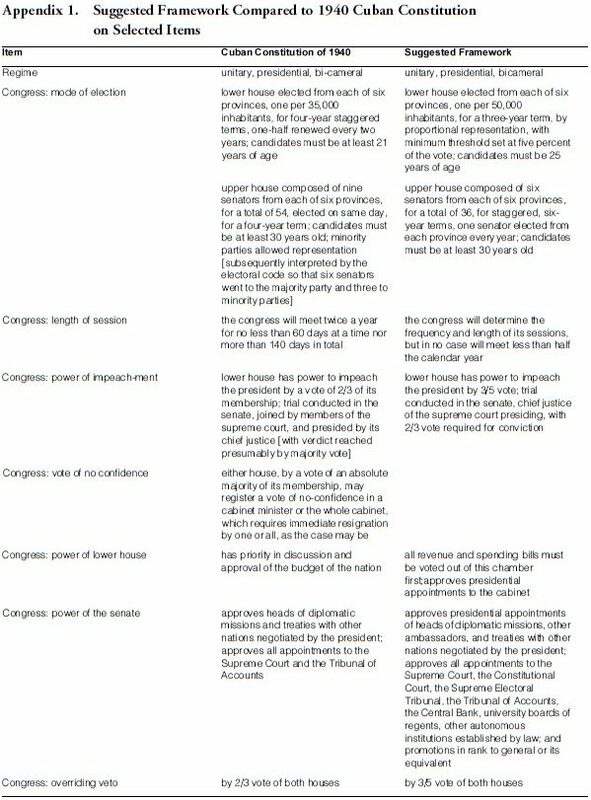 Additional congressional checks on executive power would be divided between the two houses as follows. All appointments (but not their dismissal) to the president’s cabinet would need approval by the cámara, while appointments to the courts and autonomous agencies (more about these below), as well as ambassadorships, and promotion of military officers to the rank of general (and their equivalent in the air force, navy, other armed services, and national police), would require confirmation by the senate. Also, all treaties with foreign nations would need senate ratification by a three-fifths vote of those present. The executive power would be vested in a president, elected in a nation-wide popular vote for a three-year term. To be eligible for election, a candidate would have to be at least 40 years old. The president would be eligible for reelection two more times, either sequentially or after a break, for a maximum tenure in office of nine years. Should no candidate receive a minimum 40 percent plus one of the vote, a run-off would be held between the two top vote-getters. The president would be charged with “faithfully executing the laws,” act as commander in chief of the armed forces, be responsible for conducting foreign affairs with the advice and consent of the senate, and subject to senate confirmation, make appointments to his cabinet, ambassadorships, the courts, and the autonomous agencies, and grant promotions to military officers. On the other hand, the president’s legislative power would be limited to a moderate veto (congress could override with a three-fifths vote in both houses), which must be cast within ten working days of congress having sent him a bill. He would not have lineitem veto authority: any bill would have to be vetoed in its entirety or not at all. Concerning “pocket” vetoes, this would be discouraged by the following rule: any bill sent to the president fewer than ten days before the congress adjourns, which he neither signs nor vetoes, becomes law if, within three months of the new session of congress, it passes both houses by simple majority vote. The president would be explicitly prohibited from issuing decrees except for the express purpose of implementing a law or judicial decision, regulating a statute as provided for by congress, or arranging the internal administration of the executive branch, narrowly conceived, and then again never contrary to law. In other words, “the authority of the executive to establish laws in lieu of action by the assembly”46 would be nil. As for the budget, the president would be required to submit a proposal nine months before the start of the new fiscal year, but it would be up to the congress to decide what, if any, of the president’s plan to adopt in one or more revenue and expenditure bills. Neither would the congress have to wait for the president’s budget to consider revenue and appropriations bills. This would reduce the executive’s strategic advantage over fiscal policy, an advantage derivative from his having the budgetary initiative, as is the case in many countries,47 including the 1940 Cuban Constitution. A number of autonomous agencies would be charged with administering a range of public responsibilities. 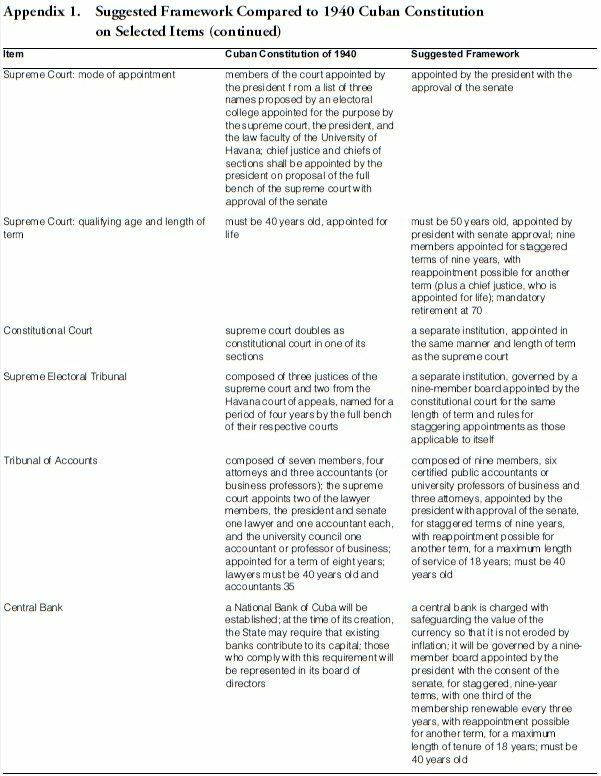 The following would have constitutional standing: an electoral tribunal, a Tribunal de Cuentas, the central bank, and university boards of trustees. The electoral tribunal would be charged with voter registration, administering elections, certifying winners, and apportioning seats to parties according to the proportional representation formula specified by law or provincial or local charters. The Tribunal de Cuentas would be charged with auditing government accounts at all levels, national ones annually and provincial and local ones at least biennially, something it would either do itself or contract out to CPA firms, reporting its findings to congress and making them available to the press and the public. The central bank would be charged with safeguarding the value of the currency so that it is not eroded by inflation. University boards of trustees would set policy, appoint top administrators and generally oversee the operations of national universities. Except for the supreme electoral tribunal, these agencies would each be governed by a nine-member board appointed by the president with the consent of the senate, for staggered, nine-year terms, with one-third of the membership renewable every three years, with reappointment possible for another term, sequentially or after a break. For its part, the supreme electoral tribunal would be governed by a nine-member board appointed by the constitutional court for the same length of term and schedule for staggering appointments as those applicable to itself. The congress would be free to create additional autonomous agencies. Below the national government, there would be provincial governments and municipalities. These would have legislative and fiscal autonomy, subject to the following constraints. On the revenue side, taxes over exports and imports would be the exclusive prerogative of the national government, and in taxing (and regulating) industry and commerce, provincial and local governments would be prohibited from discriminating between items produced or sold within their jurisdictions and those without. On the expenditure side, the national government could mandate provinces or local governments to provide for schools, water and sewers, public health, environmental protection, and other items the neglect of which at the regional or local level would have adverse national impact. To ensure at least minimal compliance with national mandates, provincial or local officials who ignore or flatly refuse to carry them out would be subject to civil suits and liable to judicially- imposed fines.50 However, one would expect that the national government would rather rely on a fiscal carrot, offering grants-in-aid and similar subsidies to persuade recalcitrant provincial or local governments to comply. Another means would be for the senate to hold hearings on the state of public services in jurisdictions that are grossly under-performing, something which would attract unfavorable publicity and, presumably, negative electoral consequences for the officials responsible. Other than that, provinces and municipalities would be free to levy taxes on property, income, sales or consumption, charge user fees for any service, and borrow money by issuing bonds, subject only to such regulations as are deemed necessary to guarantee transparency in all their financial transactions and to pay off creditors in case of default.51 Similarly, over and beyond that required to fulfill national mandates, provinces and municipalities would be free to spend their revenues for any purpose that finds favor with the voters. All provincial and municipal accounts would be subject to at least biennial auditing by the Tribunal de Cuentas or by CPA firms contracted by it for the purpose. Provincial governments would consist of an elected assembly, which would exercise legislative power, and an elected governor charged with executing the laws. Half of the assembly would be elected from single- member districts and the other half at large by proportional representation subject to a five percent threshold. Legislative districts would be drawn following the contours of municipal boundaries. Several municipalities of few inhabitants could be combined into one district, and one populous municipality divided into two or more districts, but in no case would a district be drawn with parts of two or more municipalities. Both branches would be elected simultaneously for a three-year term. All municipalities would be governed by a council or commission (elected by proportional representation, at large, or from districts, or some combination of the three) and either an elected mayor or an administrator appointed by and responsible to the council. Within these constraints, each province would be free to draw up a charter to govern its own affairs, subject to approval by referendum of the residents of the province, on the one hand, and by the national senate, on the other. Similarly, each municipality would draw up its own charter subject to approval, on the one hand by its residents and, on the other, by the corresponding provincial assembly. The charters might include a provision for provincial and local courts, respectively, with jurisdiction over their own legislation or ordinances, or either or both levels may opt to rely on the ordinary national tribunals to interpret and adjudicate their own laws, regulations, or ordinances. In either case, all decisions made by provincial and local tribunals would be appealable to the national judiciary. The electoral calendar would follow a three-year cycle, to wit: the president, the entire cámara, and onesixth of the senate would be elected one year; provincial governors and assemblies, and one sixth of the senators the next; and all municipal councils and mayors, and one sixth of the senate, the following year.52 Thus, there would be an election every year. To amend the constitution, two options would be available. One, initiated “from above,” would be by a two-thirds vote of both houses of congress, followed by a popular referendum, with a two-thirds margin required for enactment. The other, initiated “from below,” would be for two-thirds of the provincial assemblies, each by a two-thirds vote, to endorse an identically worded proposed amendment, followed by a popular referendum at the next election, with a two-thirds vote required for enactment. A transitory provision would stipulate that, twelve years after the adoption of the new constitution, the people, by a simple majority of those turning out in a referendum, would decide whether to maintain the schedule of annual elections laid out here or thenceforth to hold elections at all levels concurrently every three years. If this amendment were adopted, senate terms would be staggered so that half its membership would be renewed every three years. Although it does not fit it perfectly, several of the principal elements of the proposed constitution match those of a consensual type. These are: a legislature not dominated by the executive; a bicameral national congress, with the branches roughly equal in authority, elected according to different rules and for varying lengths of term; proportional representation in the lower house of congress, whose members are elected from districts of relatively large magnitude; equal representation of the provinces in the senate; an independent constitutional court to which a relatively rigid constitution is entrusted; an independent central bank; additional autonomous agencies; and vertical decentralization, with elected provincial and local governments. Several features are sufficiently unusual or controversial as to require justification: the electoral calendar, the mode for electing and staggering terms of the senate, the three-year term for all elected offices except the senate, and presidential re-election. Taking them in order, frequent elections are desirable for a number of reasons. For one thing, elections function as the linchpin of a republican regime, the pivot on which government policy moves in response to public opinion. By staggering the terms of different offices in the manner proposed here, Cubans would vote annually according to a three-year cycle, thus infusing government at all levels (for all elected officials would monitor election results to measure changes in public opinion) with a healthy dose of popular input. Second, after half a century of dictatorship (or more, depending on the time left to the Castro regime), Cubans need to acquire, in relatively short order, the habits and skills of republicanism. Annual elections would speed up the learning process.53 Third, frequent elections hold out hope to the losers of any one contest of victory in the next. They are much more likely to accept defeat gracefully, something that contributes to legitimating the regime, if, having lost at one level, they can look forward to a new election at another level shortly thereafter. Thus, a losing presidential candidate can seek election to the senate or as governor of his province the following year. Similarly with those who fail to win a seat in the lower house of the national congress: provincial and local elections in the next two years can yield a consolation prize. Also, having separate elections at each level would strengthen provincial and local autonomy, reducing the effect of extraneous issues on campaigns at these levels. A senate with fewer members than the number provided for in the 1940 Constitution, elected for longer, staggered terms so that one senator per province (one sixth of the total) comes up for renewal every year needs defending. First, the size, length of term, and schedule of senatorial elections are all meant to endow this body with sufficient authority, prestige, and independence, and the individual senators with enough stature, so as to make the office an attractive alternative to the presidency. Extraordinary individuals whose hunger for political recognition cannot be easily satiated but for whom the presidency is an improbable attainment, as it must be for most, should find that the senate provides an adequate outlet for their ambitions. In turn, these would be harnessed for the public good, turned into checks on the inordinate pretensions on the part of an overweening executive and, more positively, into overseers of the long-term interests of the people, particularly when it comes to the prudence of the executive’s foreign policy, the readiness of the armed forces, the effectiveness at combating crime and the respect shown for civil rights by the national police, the kind of justice meted out in the courts, the quality of higher education, the soundness of public finances and the performance of the economy, all areas governed or regulated by institutions to which presidential appointments require senate concurrence. It may be objected that having senatorial elections every year will interfere with the process of government. One might surmise that the president and his party, on the one hand, and opposition parties represented in the upper house, on the other, would be at constant loggerheads, seeking maximum electoral advantage from every disagreement or confrontation over policy. Engaged in a permanent electoral campaign, they would be less likely to compromise over issues that divide them. The plausibility of such a hypothesis led me to ask Mark P. Jones to see if he could find a relationship between election year and executive-legislative conflict in his data set. He graciously agreed to my request, and reported the results by e-mail: “There was no statistically significant difference in the level of executive-legislative conflict between election years and non-election years for the analysis population of Latin American democracies during the 1980s and 1990s.”55 This finding cannot be viewed as anything but tentative. Only experience can demonstrate whether annual elections for the senate would complicate relations between the president and the senate. Nevertheless, it is at least reassuring to know that the test came out negative, that empirical evidence on executive-legislative conflict in Latin America does not lend ready support to what is otherwise an entirely plausible hypothesis. A three-year term for all elected offices except the senate is short by world standards and goes against the grain of Latin American practice. As far as I know, only Australia, New Zealand, and Sweden have tried it. By contrast, two-thirds of Latin American countries have adopted a five-year or longer presidential term. Yet, the advantages of a three-year term are manifest. Focusing on the presidency in particular, 56 if the incumbent makes wrong decisions, and loses public support, the nation is not saddled with an unpopular and hence weak executive for long. Also, if congress and the president reach an impasse, the stalemate will be short-lived, thus reducing the risk of the government becoming mired in chronic “immobilism,” one of the potential pitfalls of presidential regimes. Furthermore, requiring even a good president to be endorsed by the voters within three years of his having been elected would contribute to his keeping in mind where the source of his authority lies. Instilling humility into presidents, who tend to be short on this virtue, would be desirable. A last advantage of a three-year term is that it reduces the cost of presidential reelection. That this is a sensitive subject in Cuban history is evident from the extremely difficult procedure which the 1940 Constitution stipulates before the clause prohibiting presidential reelection can be changed. Twice in the nation’s history a revolt broke out when the incumbent president attempted reelection or to extend his term of office. The traditional Cuban aversion to continuismo cannot but have become stronger after more than four decades of Castroism. Nevertheless, for the reasons I gave when discussing the Constitution of 1940, I believe that, on balance, it is more prudent to allow reelection than to proscribe it. By limiting the presidential term to three years, and keeping in mind that the proposed framework contemplates both a reduction of the president’s powers relative to the congress and autonomous agencies and a senate worthy of political ambition, presidential reelection should be less threatening to the opposition. Lastly, to allow presidential reelection is not to guarantee it. Nothing is more likely to deflate the pretensions of presidents and would-be presidents than an occasional defeat of one of their number in his bid for reelection. The analysis of the proposed framework would not be complete without a systematic comparison of its key provisions with those of the Constitution of 1940. This is shown in the Appendix. There are parallels as well as differences between the two designs. 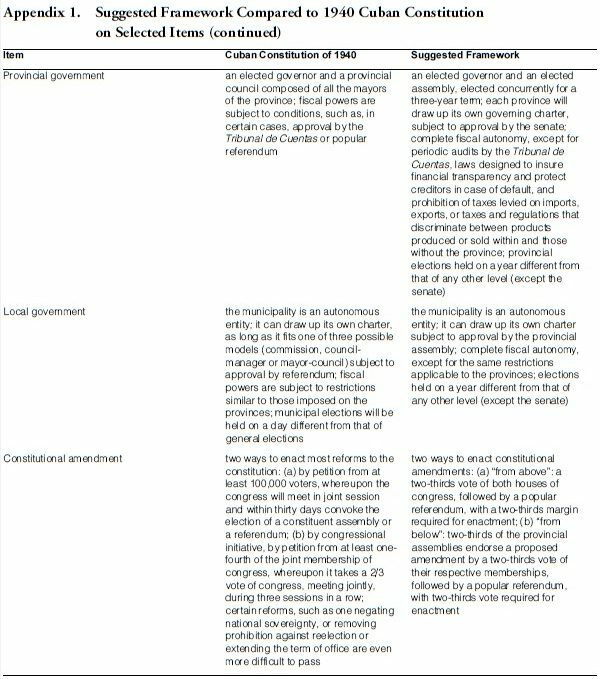 Taking the former first: like the 1940 Constitution, the proposed framework calls for a presidential, bicameral, and unitary regime. 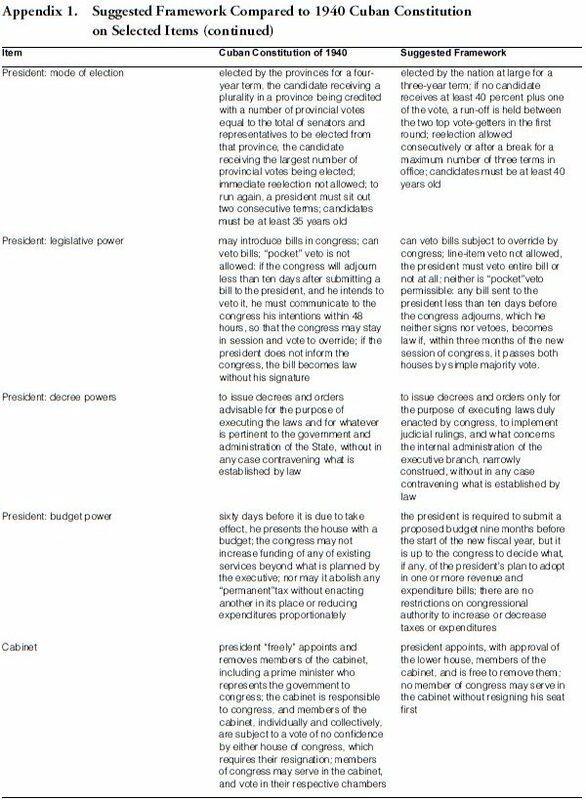 It provides for separation of powers and checks and balances between the executive and legislative branches, judicial review, a supreme electoral tribunal beyond executive or legislative control, an independent Tribunal de Cuentas, provincial governments, and municipal autonomy. Both are difficult to amend. Thus, in form, the two designs are very similar. The constitutional framework proposed in this paper is intended to promote the establishment and development of a presidential democracy in post-Castro Cuba which, although necessarily majoritarian in some aspects, incorporates many elements associated with consensual democracy. In form, the design parallels the Cuban Constitution of 1940 in most respects, an attribute that should enhance its palatability. Substantively, the proposed framework perfects the better features found in the 1940 document while remedying its structural flaws. It is hoped that this proposal will contribute to discussion and debate pursuant to the crafting of constitutions in general and, especially, of a magna carta for a free Cuba. 1. A number of scholars read the first draft of the paper and gave me the benefit of their comments and encouragement, or their criticism. Although nearly all of them disagree strongly with at least one element in this framework, they deserve my thanks, even as they are exempt from responsibility for any errors of fact or insufficient political sagacity on my part. They are: Charles W. Anderson, Juan del Aguila, Mark P. Jones, Arend Lijphart, Juan L. López, Carlos Alberto Montaner, David Myers, Mario Rivera, James A. Robinson, and Mauricio Solaún. 2. See Freedom House, Freedom in the World, The Annual Survey of Political Rights & Civil Liberties, 1997-1998, New Brunswick: Transaction Publishers, 1998. 3. Aristotle, The Politics, Cambridge: Cambridge University Press, 1988, 94-95. Edmund Burke was another champion of a mixed constitution, one, however, that grows organically, so as “to unite into a consistent whole the various anomalies and contending principles that are found in the minds and affairs of men.” See his Reflections on the Revolution in France, New York: Viking Penguin, 1969, 281. 4. Giovanni Sartori, Comparative Constitutional Engineering. An Inquiry into Structures, Incentives and Outcomes, New York University Press, 1994, 202. 5. The contrary assumption, that “constitutions do not matter, that free societies result from societal pluralism far more than from constitutional contrivance” is dismissed as “the behavioral absurdity” by Sartori, Comparative Constitutional Engineering, 200. 6. See, in particular, Arend Lijphart, Patterns of Democracy. Government Forms and Performance in Thirty-Six Countries, Yale University Press, 1999; Matthew Soberg Shugart and John M. Carey, Presidents and Assemblies. Constitutional Design and Electoral Dynamics, Cambridge University Press, 1992. 7. On the significance of founding moments, see Seymour Martin Lipset, Continental Divide. The Values and Institutions of the United States and Canada, New York: Routledge, 1990. 8. Alexander Hamilton, “Number I,” in Isaac Kramnick, (Ed. ), The Federalist Papers, New York: Penguin Putnam Inc., 1987, p. 87. 9. Alexis de Tocqueville, Democracy in America, New York: Everyman’s Library, 1972, 321. 10. Robert D. Putnam, Making Democracy Work. Civic Traditions in Modern Italy, Princeton: Princeton University Press, 1993, pp. 58-60. 11. A supposition as old as Plato’s Republic, running through the works of Aristotle, Locke, Rousseau, Burke, de Tocqueville, and Mill, down to the “neo-institutionalists”of today. 12. For a positive assessment of this form, see Quentin L. Quade, “Democracies-To-Be: Getting it Right the First Time,”Freedom at Issue, 1990, 113, 4-7. 13. Lijphart, Patterns of Democracy, Chapters 2-3 and 14-17. 14. Ibid., 302. Lijphart’s analysis and recommendations, particularly electing the legislature by proportional representation and organizing coalition cabinets, has not gone unchallenged. See the “debate” between him and his critics published in Journal of Democracy, 1991, 2 (3): Guy Lardeyret, “The Problem with PR,” 30-35; Quentin L. Quade, “PR and Democratic Statecraft,” 36-41; Arend Lijphart, “Double-Checking the Evidence,” 42-48. See also Sartori, Comparative Constitutional Engineering, 70-74, 129. 15. Shugart and Carey point out that there has not been a single instance of a country exchanging a presidential system for a parliamentary one, although changes in the reverse direction have occurred. See Presidents and Assemblies, 3. 16. Lijphart, Patterns of Democracy, 306. 18. Juan Linz, “The Perils of Presidentialism,” Journal of Democracy, 1990, 1 (1), 51-70; Alfred Stepan, “Constitutional Frameworks and Democratic Consolidation,” World Politics, 1993, 46 (1), 1-22. 19. See, also, Scott Mainwaring and Matthew Soberg Shugart (Eds. ), Presidentialism and Democracy in Latin America, Cambridge University Press, 1997, especially Chapters 1 and 11 and, by the same authors, “Juan Linz, Presidentialism, and Democracy,” Comparative Politics, 1997, 29 (4): 449-472. 20. Shugart and Carey, Presidents and Assemblies, 154-161. 22. Mark P. Jones, Electoral Laws and the Survival of Presidential Democracies, Notre Dame: University of Notre Dame Press, 1995, 52. 23. Along these lines, see Scott Mainwaring, “Presidentialism, Multipartism, and Democracy. The Difficult Combination,”Comparative Political Studies, 1993, 26 (2), 198-228. But see Timothy J. Power and Mark J. Gasiorowski, “Institutional Design and Democratic Consolidation in the Third World,” Comparative Political Studies, 1997, 30 (2), 123-155. In a study of over 50 Third World transitions to democracy since the 1930s, they find no empirical support for the “difficult combination” hypothesis (or, for that matter, the “perils of presidentialism” thesis). However, their rules for selecting cases and for declaring democracy to be consolidated differ from those of most other studies. 24. For parallel findings in Latin American countries, see Jones, Electoral Laws, 50. 25. Jones believes that in presidential systems a two party system is “desirable.” Ibid., 10. 26. E.g., in Costa Rica the leading candidate need win only 40 percent of the vote to avoid a run-off. 27. Shugart and Carey also suggest that the parties be moderately disciplined, a condition facilitated by closed party lists. However, Jones found that closed party lists are associated with executive-legislative conflict. See, respectively, Presidents and Assemblies, 205 and Electoral Laws, 52. 28. Sartori, Comparative Constitutional Engineering, 198. 29. René Gómez Manzano, “Constitución y Cambio Democrático en Cuba,”Cuba in Transition—Volume 7, 1997, 395-414; Néstor Carbonell Cortina, “La Constitución de 1940: Simbolismo y Vigencia,” Cuba in Transition—Volume 7, 1997, 415-421. 30. Marifeli Pérez-Stable, The Cuban Revolution. Origins, Course, and Legacy, Second Edition, New York: Oxford University Press, 1999, 9. 31. José D. Acosta, “El Marco Jurídico-Institucional de un Gobierno Provisional de Unidad Nacional en Cuba,” Cuba in Transition— Volume 2, 1992, 61-84. 32. I have relied on Spanish and English versions of the text of the 1940 Constitution. For the former, see Mariano Sánchez Roca, Leyes Civiles de Cuba y su Jurisprudencia, Vol. I, La Habana, Editorial Lex, 1951, 1-100 and, for the latter, Amos J. Peaslee, Constitutions of Nations, Volume I, Concord, NH: The Rumford Press, 1950, 526-594. For the motivations of the drafters, and how well the system actually worked in practice, see William S. Stokes, “The Cuban Parliamentary System in Action, 1940-1947,” The Journal of Politics, 1949, 11 (2), 335-364; Hugh Thomas, Cuba or The Pursuit of Freedom, Updated Edition, New York: De Capo Press, 1998, 691-789; Charles D. Ameringer, The Cuban Democratic Experience. The Auténtico Years, 1944-1952, Gainesville: University Press of Florida, 2000. 33. This is not to deny that extra-constitutional factors played at least as important a role in the demise of Cuban democracy. The appeasement of political gangsters by both Grau and Prío was a particularly nefarious practice. See Ameringer, The Cuban Democratic Experience. 34. Stokes, “The Cuban Parliamentary System,” 362. 35. Something pointedly denied by Carbonell, who concludes that “los fallos de nuestro sistema semiparlamentario . . . no fueron realmente orgánicos, sino funcionales—producto de viejas corruptelas y de hábitos presidencialistas arraigados. Esos fallos son superables, a mi juicio, con una buena dosis de democracia, experiencia, y probidad.” Carbonell, “La Constitución de 1940,” 421. 36. Recent examples of newly-elected presidents who made it a priority to change the constitution to allow their reelection are Menem in Argentina, Cardoso in Brazil, and Fujimori in Perú. For its part, Venezuela offers two examples of former presidents who, bent upon making a come-back, prevented their parties’s renewal: APRA’s Andrés Pérez and COPEI’s Rafael Caldera. These two men bear at least some responsibility for the decline of their respective parties, an erosion which paved the way for the populist demagogue Hugo Chávez to sweep the political slate clean. 37. Ameringer, The Cuban Democratic Experience, 77-78. 39. True, now that it does not have to accommodate José Figueres (elected first in 1953 and then again in 1970), Costa Rica is free of that problem. But there the tradition of one-term presidents has taken such deep roots that presidents see no mileage in taking it on. 41. For earlier papers published by ASCE that address many of the issues dealt with here, see, in addition to those already cited, the following: Néstor E. Cruz, “Legal Issues Raised by the Transition: Cuba from Marxism to Democracy, 199?-200?,” Cuba in Transition— Volume 2, 1992, 51-60; Jorge Salazar-Carrillo, “The Case for an Independent Central Bank,” Cuba in Transition—Volume 4, 1994, 77- 79; Matías F. Travieso-Díaz and Steven R. Escobar, “Overview of Required Changes in Cuba’s Laws and Legal Institutions During its Transition to a Free-Market Democracy,” Cuba in Transition—Volume 4, 1994, 262-291; Luis L. Ubierna and Juan J. Ondarza, “Proyecto Constitutional: República Federal de Cuba,” Cuba in Transition—Volume 4, 1994, 330-349; Néstor E. Cruz, “Legal Policy for a Free Cuba: Lessons from the Civil Law,” Cuba in Transition—Volume 5, 1995, 191-194; Rebeca Sánchez-Roig, “Cuban Constitutionalism and Rights: An Overview of the Constitutions of 1901 and 1940,” Cuba in Transition—Volume 6, 1996, 390-397; Alberto Luzárraga, “El Tribunal Constitucional y su Organización: Una Propuesta de Reforma,” Cuba in Transition—Volume 7, 1997, 422-426; Lorenzo L. Pérez, “Comentarios Sobre el Artículo XVII Sobre Hacienda Pública de la Constitución de 1940 de Cuba,” Cuba in Transition— Volume 7, 1997, 427-429. 43. An assumption not shared by Gómez Manzano. His list of all the “most obvious objections” to a restoration of the 1940 Constitution just as it was when buried by Batista begins with the following: “Contiene la enumeración de las antiguas seis provincias, lo cual— como es lógico—no se ajusta a la realidad cubana de hoy” (“Constitución y Cambio Democrático en Cuba,” 409). But this begs the question on whose authority Fidel Castro dismembered and mangled the country, breaking up the six provinces into more than twice their number. In my judgment, just as in Russia one of the first things that was done after the demise of the Soviet Union was for old cities like St. Petersburg to recover their venerable names, so in Cuba one of the first orders of business after the Castro regime has finally expired is to restore the sexpartite division of the Island. Of course, the new constitution, like that of 1940, should include a provision for provincial subdivision, but something that is to be done not arbitrarily, as the Castro regime did, but with the consent of their elected representatives and that of congress. 44. Lijphart, Patterns of Democracy, p. 150. 45. Should the present subdivision be retained, the number of senators elected from each province would be reduced to three and their terms staggered so that one would come up for reelection every other year. 46. John M. Carey and Matthew Soberg Shugart, Executive Decree Authority, Cambridge University Press, 1998, 9. They note that “The boundaries of executive discretion, if any, are established by the constitution.” Ibid., 14. 47. Shugart and Carey, Presidents and Assemblies, 139. 48. I leave open the qualifications, mode of appointment, and length of term of trial and appeals courts. Like other civil law systems, e.g., present-day France and Portugal, the 1940 Cuban Constitution provided for a sort of judicial civil service, admission to which was by competitive examinations. I am agnostic as to whether this system should be replicated in the new constitution. 49. These specifications are a composite drawn from several actual models. According to McWhinney, “By a sort of common consensus among constitutionalists, in various, widely differing legal systems, the norm seems to have emerged that a final tribunal should be composed of eight or nine members.” Also, appointing judges to the highest magistracy of the nation not for life but for a fixed term, “with or without right of renewal of the term, seems more in tune with contemporary constitutionalism and constitutional trends in it.” Edward McWhinney, Supreme Courts and Judicial Law-Making: Constitutional Tribunals and Constitutional Review, Dordrecht: Martinus Nijhoff Publishers, 1986, 36, 63. In the Cuban Constitution of 1940 (as in the United States), the president nominates and the senate confirms lifetime appointments to the highest court. The French constitutional court consists of nine judges, appointed for nine years, staggered so that one-third is replaced every three years. In the International Court of Justice, the same applies, except that reappointment is possible. In Japan, the mandatory retirement age is 70. There, as in France, judges are normally appointed in the ir sixties. 50. Alexis de Tocqueville showed how in early 19th century New England local governments would be brought into compliance with state laws not through a hierarchy of administration but by judicial action. See Democracy in America, 70-79. 51. The fiscal power of provinces and municipalities would be subject to several political checks, including those exercised at the voting booth and, perhaps most importantly, by businesses and residents who would “vote with their feet,” changing place of residence in response to high taxes, bloated budgets, and otherwise irresponsible fiscal management. 52. To begin the cycle, upon adoption of the constitution elections for all offices would be held simultaneously. This would be followed by new elections for provincial governments and one-sixth of the senate the next year and for local governments and one-sixth of the senate the year after that. Thus, initially, only the president and the cámara would enjoy a full term. Also, upon first being elected, all senators, meeting by province, would draw lots for the initial length of term, which would range from one to six years. A similar method would allocate length of terms to the initial appointments to the courts and the autonomous agencies. 53. Be it noted that Taiwan, whose transition to democracy has been one of the smoothest on record, has held an average of one election per year for one office or another for a decade. See James A. Robinson (in participation with Deborah A. Brown and Eric P. Moon), Appraising Steps in Democratization. Taiwan Elections, 1986-2000, Pensacola, FL: The University of West Florida, 2000. 54. On the “necessity of a well-constructed senate,” see James Madison, “Number LXII” and “Number LXIII,” in Kramnick, The Federalist Papers, 364-375. Also, be it noted that one of the criticisms that Burke leveled against the French revolutionaries was that they had made no provision for a senate. See Reflections on the Revolution in France, 316. 55. Mark P. Jones, personal communication, October 3, 2000. 56. Mainwaring and Shugart suggest the possibility of a three-year term for the president. See their Presidentialism and Democracy in Latin America, 38. 57. This should provide a check on the contemporary trend, witnessed not only in the United States but in many places around the world, of judges arrogating to themselves legislative and even administrative powers which in a republican regime are or should be the prerogative of elected officials. See C. Neal Tate and Torbjörn Vallinder (Eds. ), The Global Expansion of Judicial Power, New York: New York University Press, 1995.